At Healthy Options, we value not only the skills and experience of our instructing team but also the fact that they are always friendly and approachable. We are very lucky to be able to recruit a team of highly-skilled instructors many of whom run their own Yoga or Pilates schools but enjoy the chance to come and teach in Greece for a few weeks or months a year. It is great to be able to tap into their wide variety of skills and specialisms for the benefit of our clients. “The instructors were exceptional - highly experienced and passionate about what they do. They are always willing to answer your questions or just have a chat. They were very knowledgeable. I enjoyed Jacquie's Flow Yoga and Evy's Pilates classes, and Lexi's Yin Yoga were really great- this type of Yoga was a new and enjoyable experience for me!” Claire Anderson, Teacher, Canterbury. This week we are talking about a Healthy Options Instructor who may well be familiar to you Lexi has been with Healthy Options almost since it began and she is the sister of Healthy Options founder Varvara. Alexia now manages our Healthy Options Centre in beautiful Syvota. 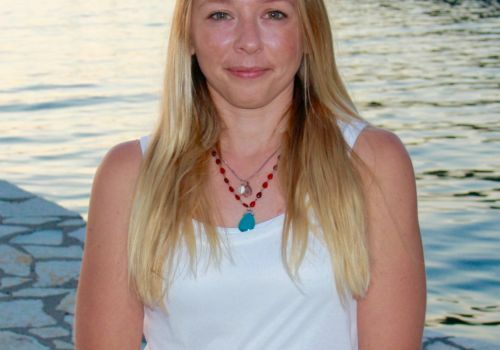 After many years of practicing yoga and developing a profound interest in alternative therapies and the numerous physical and psychological benefits of yoga, Alexia pursued her aspirations and qualified as a 200hr Yoga Alliance teacher and as a therapeutic Thai massage therapist. She is a firm believer that rediscovering that connection between the body and the mind is the key to overcoming any obstacle in life and living it to its full potential. Her teaching style is a personal mix of Hatha yoga and Vinyasa techniques, aimed at empowering individuality whilst synchronizing breath awareness with correct posture alignment in order to create a harmonious flow of movement and a stillness of the mind. She also teaches Yin Yoga, Yoga Nidra and meditation and her Thai massage incorporates elements from yoga, meditation and breath awareness so as to release tension and truly experience a deep state of relaxation.